Waging Peace by Allen Mondell examines the Peace Corps experience through the personal stories of volunteers serving throughout the fifty year history of the organization. This film tells Peace Corps stories from around the world, and it tells the continuing stories of returned volunteers. Waging Peace is an excellent film, massive in scope, which captures the Peace Corps experience from a broader sociopolitical perspective. Waging Peace weaves the letters, journals, emails and blogs from Peace Corps Volunteers around the world with the profiles of four returned Peace Corps Volunteers who today are still trying to make a difference. Allen Mondell was a Peace Corps teacher in Sierra Leone from 1963 - 1965. For the past forty years he's been a documentary filmmaker. He spent two and a half years making a film about the Peace Corps experience, and how it has shaped lives. 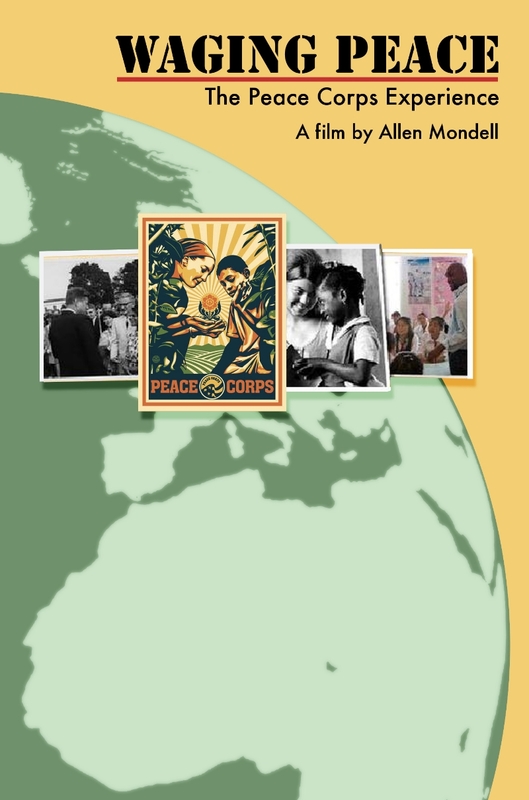 In this film, Mondell has gone back to his early years to try to understand why he and the other volunteers were so deeply affected by their brief Peace Corps experience overseas--and why that experience continues to affect their lives to this day. The stories he finds are hardly sentimental or drowned in self-admiration. Instead, they capture the seemingly insurmountable challenges of ordinary Americans who were willing to enduring vast cultural isolation, poverty, suspicion and, at times, antagonism--all in the hopes of making a small difference. At times hilariously funny, and at other times grimly sad, Waging Peace is full of perceptive insights into sacrifice and hardship, courage and defeat—and, ultimately, hope. At a time when society desperately relies on volunteerism, Waging Peace is also an inspiring call to other Americans, young and old, to cross cultural lines in order to discover a new awareness of the world and, in the end, to wage peace. If Sargent Shriver, the founding director of the Peace Corps, were here to see this film his heart would leap up and want the world to see it. He intended the Peace Corps to be seen as — and the Volunteers to see themselves as — waging peace. I loved making this film. It was like re-living for the past two years, albeit vicariously, my Peace Corps experience. The Peace Corps gave me an opportunity to do things I would never have done at 21, then a recent college graduate. I was idealistic, energetic and open to a unique adventure. And that’s what I got. The enduring aspects of that experience – it helped me decide the kind of work I wanted to do, that I wanted to change attitudes and actions that I thought needed changing and that being sensitive and understanding were key ingredients in a diverse world. These ingredients were the motivations for making a film that not only recounted the various experiences of Volunteers but also showed the paths that many take after they leave the Peace Corps. As I was making the film and telling people what I was doing, they were either surprised that the Peace Corps still existed or they just didn’t hear anything about it anymore. So, among many mainly positive comments after the premiere in Dallas on June 21st, I was delighted when a friend told me that his 18 year old son and the son’s girlfriend left the screening saying that they loved the film and wanted to seriously consider joining the Peace Corps. I hope this message will come across as we distribute the film to colleges, high schools, middle schools, public libraries, religious institutions, civic groups and to individuals who might consider joining the Peace Corps or volunteering in their own communities. Allen Mondell has worked in films and television as a writer, producer and director for 35 years. He began his career as a newspaper reporter in Baltimore in the mid-sixties and then went to work in 1968 for Westinghouse Broadcasting in Baltimore (WJZ-TV), first as a writer for a magazine program and then as a writer/director of documentary films about urban and social issues. Moving on to KERA-TV in Dallas, he spent five years as a writer, producer and director of documentaries and special programs. Allen taught in the Peace Corps in West Africa after graduating from Williams College with a B.A. in American History and Literature. He serves on the boards of the Texas Jewish Historical Society and the Dallas Producers Association. Allen and his wife, Cynthia Salzman Mondell, have been making award-winning docu-dramas and documentary films and videos for over 25 years. Their work explores a wide range of subjects but always with the goal of personalizing often complex social problems. They’ve looked at different cultures and issues using dramatic re-enactments, intimate character studies and archival footage. Many of their films have aired nationwide on public television, cable and at festivals worldwide.